Friday August 20th 1897 Did morning work and went over to Emma Weldies for dinner. Will went to town but he got back in time had a very pleasant days visit. weather still cool. Saturday August 21st 1897 Did morning work and Will took us up to Nelsons to spend the day. The Stevens came down in the afternoon. we had a splendid days visit. came home to do chores. Sunday August 22nd 1897 I was busy all forenoon with the work and getting dinner. In the afternoon we took Ida and Nellie home. John Mc-- and Callie with other friends started on the Buffalo excursion tonight. weather warmer. 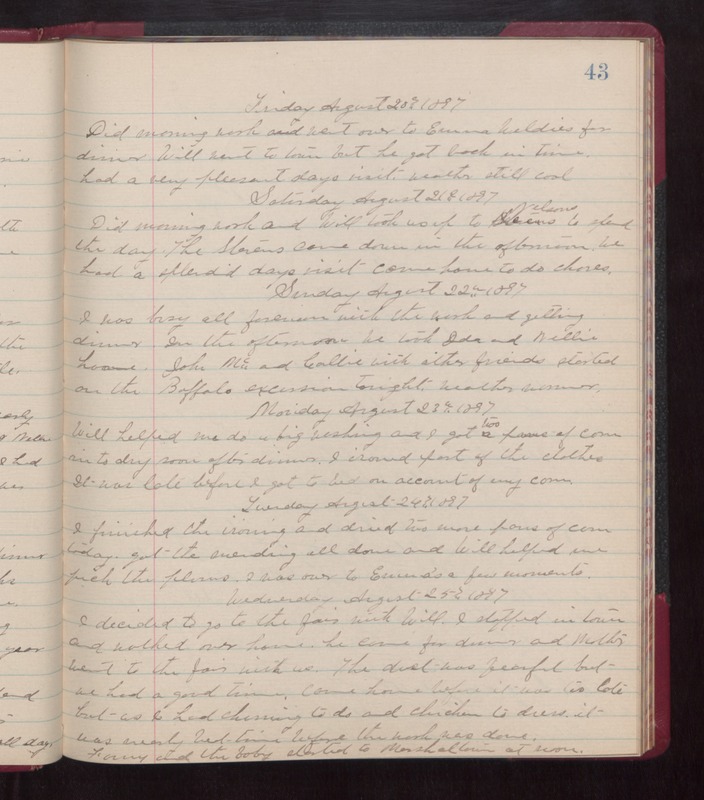 Monday August 23rd 1897 Will helped me do a big washing and I got two [pans?] of corn in to dry some after dinner. I ironed part of the clothes. It was late before I got to bed on account of my corn. Tuesday August 24th 1897 I finished the ironing and dried two more [pans?] of corn today. Got the mending all done and Will helped me pick the plums. I was over to Emmas a few moments. Wednesday August 25th 1897 I decided to go to the fair with Will. I stopped in town and walked over home. he came for sinner and Mother went to the fair with us. The dust was fearful but we had a good time. Came home before it was too late but as I had churning to do and chickens to dress it was nearly bed time before the work was done. Fanny and the baby started to Marshalltown at noon.